Amidst the daily flurry of duties and obligations – there is a breath. A single breath, one which I remember to take and suddenly my own consciousness comes back to me. Some days I move completely on auto-pilot. I go through my motions and forget that though meaning doesn’t have to fill my every action, it does happen to fill most. I wake up early for my dogs and my boyfriend. I cook because I love. I wash the dishes so that I can cook. I walk to see the excitement on my dogs’ faces. I work so that I can spread happiness and ease to my loved ones. This past weekend, I had the entire weekend off. I didn’t work once. Additionally, I also didn’t have to beg to have the weekend off. It just happened that way. Though the weekend was busy, it was that single breath I had mentioned earlier. The one that makes me remember why I work so hard. Every day that I’m at work, I wish to hug the necks of my dogs tightly, take my mother shopping because she loves shopping, visit with my father, talk to my sister who lives so far away, cater to my boyfriend who also works so very hard. The daily grind is exhausting and it’s easy to lose sight. The repetition and momentum that each day builds and pushes me forward can feel so very mundane at times. But then – I pause. I take that breath. That breath is solely for me. Feeling floods me from the very tips of my toes to the end of my nose. Cooking this sort of food isn’t always pretty. Beyond Instagram and Pinterest, people forget that food wasn’t always propped and designed to look like a French nobleman’s table in the 1600s. Food, in itself, is beautiful. The craftsmanship it takes to prepare sausages or to recognize the potentiality in a head of cabbage is a skill that takes time to acquire and a certain heart to appreciate. This dish is incredibly easy to prepare and simple to come together but because it’s so simple, it’s not entirely aesthetically pleasing. However, it IS warming. It is therapeutic in it’s preparation.The act of braising anything and having the aromas of the food waft up towards your face as you inhale heavily is probably one of the best experiences in the world. The balsamic cabbage is heady with garlic and scents of caraway seeds. The buttery, herbaceous potatoes fill your house with the most glorious of smells as they roast in the oven. Nothing, I repeat, NOTHING is better than a roasted potato. Or any kind of potato for that matter. Preheat your oven to 420 degrees F. In a medium baking dish, toss your cubed potatoes with your melted butter, sage, parsley, rosemary, salt, pepper, and garlic powder. Be liberal with the salt. An under-salted potato is a sad thing. Put into oven once the oven is preheated and bake for 25-30 minutes or until fork-tender and browned on the outside. Sear your sausages in a tbsp of oil in a skillet on medium heat until brown on all sides. Once the sausages are brown, take them out of the skillet and put a bit more oil in the pan and sauté your sliced onions and garlic until the onions soften. Throw in your sliced apples, caraway seeds, and half of the vegetable stock (use more if you need to) to deglaze the pan. Make sure to scrape up the bits off the bottom of the pan. Put your shredded cabbage in as well as the rest of the vegetable stock, maple syrup, and balsamic vinegar. Stir the best you can and cover the pan so that the cabbage can wilt. Stir occasionally so that the bottom doesn’t burn. Once the cabbage has wilted and the apples are tender, taste the cabbage and make sure it has enough salt. 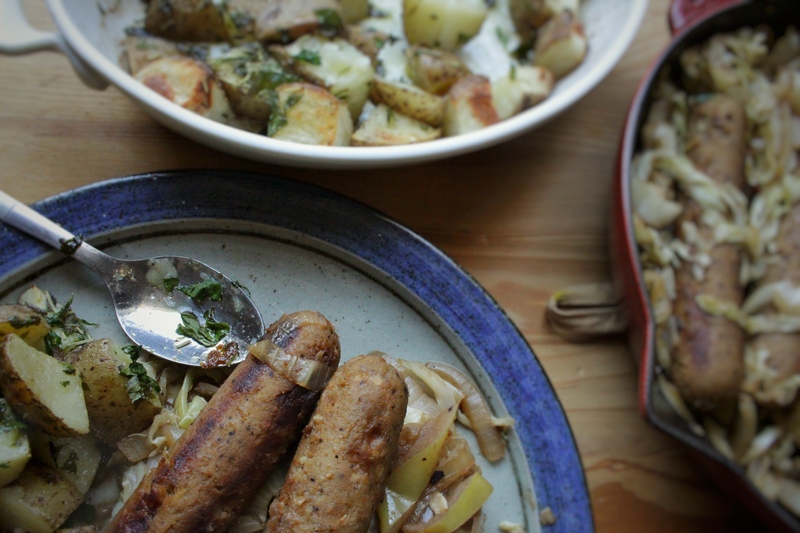 Then place the sausages in the pan with the cabbage and cover and let it cook on medium-low for another 10 – 15 minutes. Once the potatoes are finished roasting – sprinkle the tbsp of fresh lemon juice over top. Serve with the sausages immediately. All the pictures were taken by the talented Nick Wilkins. Follow his Instagram @wilklens.